The last war between Asia's giants erupted in October 1962. Fifty years on the respective works of a Chinese and an Indian intellectual define the shape of their 21st-century contest. For both, democracy is the key issue, for good or ill, that will define Asia's future. A half century ago, on 20 October 1962, China’s People’s Liberation Army stunned the world when it pushed into India far beyond the disputed frontier. Almost as suddenly as it began, the Sino-Indian war ended one month later. Chinese troops withdrew from most of the territory that they had captured, and India lamented what prime minister Jawaharlal Nehru called its “national humiliation”. Fast-forward fifty years, and there have been dramatic changes. Both countries have emerged from political hardships to open up their economies and societies to foster rapid economic growth. China has become the “workshop of the world”, while India is the “back-office of the world”. Although many in Asia like to criticise neo-liberalism and western hegemony, these two countries have been the key beneficiaries of globalisation. Relations between the two Asian giants have warmed as well: trade is growing so fast that China has replaced the United States as India’s largest trading partner. 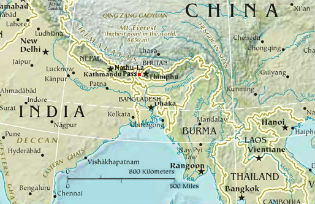 Outsiders often look to the rise of China and India as evidence of the grand shift of power from the west to the east. But how do Indian and Chinese intellectuals see the Asian century? And what do they think of each other? Public intellectuals in both countries are interested in moving from discussions about quantity to ones about quality, from the metrics of “made in Asia” to ideas that are “created in Asia”. Both see themselves as alternatives to the US-dominated world order. Each wants to shape the emerging post-American international system with its own ideas and norms. Both promise peace and harmony in a more multilateral world system that will better represent the wishes of the global south. Curiously, though, very few Indians and even fewer Chinese have shown an interest in the other country. Although China and India have a combined population of 2.6 billion people, in 2010 there were less than a million visits between the two countries. Beneath the thin veneer of “Asian brotherhood”, Chinese-Indian discourse is characterised by deep mutual suspicion. The border dispute is still a thorn in the side of China-India relations. It is the longest disputed border in the world. According to Indian sources, it is one of the hottest as well, with over 200 low-grade military incidents over the past four years. Beyond hard-power clashes, Chinese and Indians are involved in a sharp debate over the values that should shape the new world order for the “Asian century”. While many are impressed by India’s high-tech companies and creative industry, former Chinese diplomat Zhang Weiwei characterises India as the land of slums and terrorist attacks in his book China Shock: The Rise of a Civilization-State (2011). The Indian member of parliament and former diplomat Shashi Tharoor is impressed with China’s modernisation strategy that yielded the Beijing Olympics and the Three Gorges Dam. But in his book Pax Indica: India and the World of the 21st Century (2012), Tharoor reasons that “the dragon could stumble where the elephant can always trundle on” – because eventually Beijing will come to the point where authoritarianism no longer works. This China-India debate thus discusses the merits (and demerits) of democracy, providing an interesting twist to the popular thesis that sees democracy as “western” and order as “Asian”. Zhang certainly questions the universality of democracy by defining it as a thoroughly western cultural problem. He even transforms India into western country because it uses what he calls the “flawed Western political system”. Rather than acknowledging India as the world’s largest democracy, he recalls that Mumbai has Asia’s largest slum. Zhang thus traces all of India’s problems – poverty, corruption, communal violence, terrorism – to its parliamentary system of government. Tharoor, on the other hand, sees pluralism and democracy as the values that have fostered India’s success. He agrees that India has big problems, but still passionately argues that democracy has kept India’s diverse citizenry together and allowed the country to enjoy growing prosperity. Zhang’s book is characterised by negative campaigning: he spends much more time criticising India – and almost every other country – than on clarifying what he means by the China model. Zhang thus dismisses India as part of his campaign against democracy (and the west). Tharoor is more sanguine about China’s recent achievements. He is impressed by Shanghai, seeing it as a first-world city that is miles ahead of New Delhi. But Tharoor worries about the human cost of the China model, because China’s breakneck speed of development has meant that “some necks have been broken”. He concludes that while China has successfully built the “hardware” of development (infrastructure and industry), India is better at creating the “software” of development (technology, law and services). These two books are important because they are more than the musings of ivory-tower scholars. Zhang’s China Shock has sold over one million copies, and reportedly was read over the summer by China’s next leader, Xi Jinping. Tharoor’s Pax Indica is the work of a former deputy foreign minister who still influences policy discourse. These two public intellectuals show how India and China both see themselves as alternative models of development and world order that challenge the prevailing western-dominated international system. But they offer different sorts of model as a replacement. China sees itself as an alternative to the US, and its liberal democracy and neo-liberal capitalism. India, on the other hand, presents itself as an Asian democratic alternative to China’s authoritarian capitalist model. The disputed border thus is not the only site of clashes between these two Asian giants. China and India are also engaged in an ideological struggle for the leadership of the Asian century. While it is common to hear about post-American world orders that are inspired by exotic Asian values, the main topic of the China-India debate is surprisingly familiar. Both sides think that democracy (for good or ill) is the main factor that will shape the Asian century.